Hypno5e are an experimental/ambient metal band from France. I have to say, I’m not quite sure what to make of the music. If you’re looking to cruise down the highway in the middle of June with the windows rolled down, this is not the album for you! But maybe if you like driving down the highway in the middle of January with the windows rolled down, it is for you. 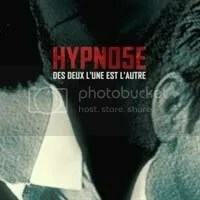 I was not familiar with Hypno5e until coming across this album, but I do know that Des Deux l’Une Est l’Autr has many moods that change as often as the seasons (well, until that global warming thing hit us, that is). At times, it it beautiful and peaceful and calm. Then the next note could evict anger, violence and fury. And they do this in French and English! As I said, the band is “experimental metal” & ambiance, so it’s basically a mix of extreme metal and calm, dark, atmospheric, eerie moments. At times, I hear bits of Avenged Sevenfold and Tool. It’s those eerie moments I appreciate most. The music can be downright haunting and I like that. Most of the songs are pretty long, so it’s definitely not an album to be used as background noise to just breeze through, but it’s an interesting journey the whole 70+ minutes and well worth checking out for those who have a sense of adventure in what they listen to.